Well I recently picked this up from a member on here and I have decided to sell it and finish my 20b and buy some things to make my shop stronger. My original plan was to build this into a 1000+ ho P port turbo monster and place it into the rx3 and still will if this does not sell. This is a Jeff Bruce built 23a 4 rotor kit. Yes a 12a based 4 rotor. This is brand new never been fired. It was put together previously but never ran. Its build to take any punishment. Fully balanced for 83-85 12a rotors. 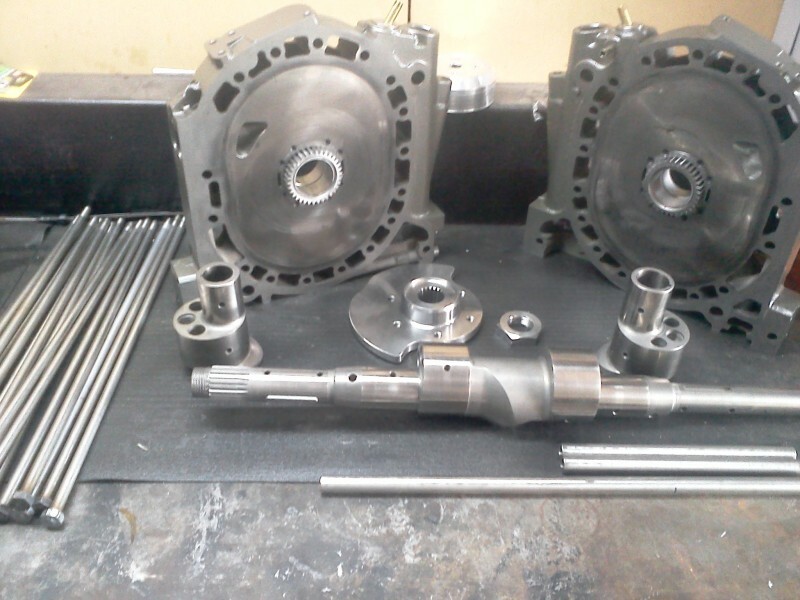 The side plates are used irons in spec and rechecked by Dan Atkins and are machined for the bearing mod. This is not much longer than a 20b which makes it really neat. You can fit this into almost anything. The only thing I noticed out of ordinary is little spot on the corner of a lobe that is flat. Nothing to worry about at all it happened when Jeff Bruce built it from my understanding. Dan Atkins looked over this after it arrived and is nothing to worry about and will not effect anything. I too build rotarys and I knew right away its nothing to worry about otherwise I would not have bought it. I just want to be clear and honest so no surprises. Like I said this kit is brand new. When I say kit that means its everything you need to make a 4 rotor. You will need 12a housings, rotors, side plates and a oil system. This is a rare opportunity for a very rare motor. Scoot sports has a p ported 23a in japan and there is or was a 23a in a fd in the states but was a side port motor. The modded side plates are gsl se so they have the injector bosses which is kinda cool also. The side plates are also port matched 74 spec ports. I have r5 side plates i will also sell and I also have 4 gsl-se housings in great shape that cam be machined down at goopy to run as 12a as gsl-se has the small exhaust inserts and are the only 13a housings you can do this to from my understanding with Jhonathan at goopy. This is also on the other forum as well. I take only paypal and my feedback is steller. Im mostly on the rx7club and thats where I have all my feedback. I have done 5k+ in single transactions with not even a hiccup. Im asking $8000 shipped to us states excluding Hawaii and Alaska.